These ready to use barbecues in foil trays, you would think are simple to use but we do know how to get the best from these great little BBQ’s, just follow the instructions and these 5 simple techniques. It sounds simple but this is where some can fail, just shake the bbq contents flat rather than leaving it all heaped to one end! plus it will light far better as well. You need to wait until the flames have stopped fully (this can take 10-15minutes), if you start to cook straight away your sausages will only have charcoal outers and raw uncooked inners, the charcoal gets hotter and changes colour to be grey ash covered coals, this is when its ready to use – our instant bbq’s can cook for well over an hour so there’s no need to rush. After 10 mins and if the flames have stopped flaming and the bbq is very smokey – just hook a metal fork under the grill and agitate the bbq side to side and relight it. Shaking can also relight or accidentally spread hot ashes out of the bbq so be careful! Yes you can do this even on an instant BBQ, when the ash has formed and the flames stopped before you start to cook just lift the grill using a metal fork or similar to slide the hot coals over to one end of the grill, so you can slide your burgers away from the heat, so you don’t over cook them. Remember to place your grill with an air gap at the base, so before you light find 4 equally sized large rocks, bricks are ideal, to be placed under the grill to raise it up from the ground, remember don’t place directly onto the floor, grass, or even your patio flags as these can create over 400*C on the base of the grill. Many cracked patio floors or grass moor fires have been blamed on doing this so don’t become a statistic. If you use it on the beach the sand directly under the bbq will stay hot when its removed, so watch where you stand!! 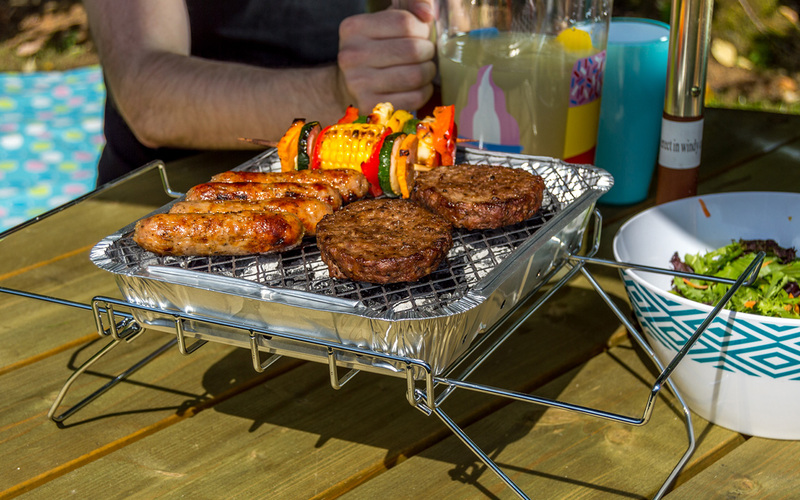 Better still is click to buy our sturdy chrome re-usable folding wire stand, to turn our instants into an excellent refillable table top grill.